Pascal LeFrancois limped in and Max Steinberg checked. The flop came K J 4 and Steinberg bet 140,000. LeFrancois made the call. The 5 on the turn prompted Steinberg to bet 360,000. Once again the bet was called. The 10 hit the felt and Steinberg moved all in. LeFrancois contemplated briefly before making the call with the J 6 . Steinberg’s 4 3 was no good and he was eliminated in second place. LeFrancois won the bracelet and $568,974. Pascal LeFrancois opened to 180,000 on the button. Kevin Howe reraised to 455,000, prompting a four-bet from LeFrancois. Howe moved all in and LeFrancois made the call with the K K , while Howe tabled the A 10 . The flop of 8 5 3 gave Howe the nut flush draw, however the turn and river bricked and he was eliminated in third place. Kevin Howe bet 140,000 from the cutoff and David Aue shipped from the small blind. Howe made the call and exposed the 9 9 and was far behind the 10 10 of Aue. The flop came 7 6 4 and everything looked good for Aue. The 10 on the turn gave Aue a set but gave Howe four outs to win. The 8 on the river sent Aue to the rail in heartbreaking fashion. Kevin Howe was at it again. This time he made it 140,000 from under the gun and Daniel Wjuniski shoved for 830,000 on the button. Max Steinberg was caught in the middle and moved in over the top. Howe mucked and Wjuniski exposed the 7 7 . He was in horrible shape against the J J of Steinberg. The board offered no help for Wjuniski and he was eliminated. In a blind vs. blind battle, Kurt Disessa moved all in for 410,000 with the Q 9 and was called by the A 2 of Kevin Howe. The board ran out A J 5 Q A and Disessa was eliminated. James Andersen bet 150,000 preflop and action was folded to Daniel Wjuniski, who moved all in. Andersen made the insta-call for his tournament life and exposed the A A . Wjuniski tabled pocket tens and was way behind. However, the flop came 10 5 3 giving the underdog a set and the huge advantage. The turn brought the K and the river bricked with the 4 . Andersen was eliminated. Players are now on a short 20 minute break. Josh Brikis (570,000) and Saar Wilf (315,000) were all in against the bigger stack of Max Steinberg. Brikis tabled the A K and was unhappy to see the A K of Wilf. Steinberg exposed the J J and had his two opponents in bad shape. The board ran out Q 7 5 6 8 and Steinberg recorded the double elimination. The remaining 10 players have gone on a 60-minute dinner break and will return to play at 9:20 p.m.
A total of 2,341 players registered for the event, amounting to a prize pool of $3,160,350. The remaining players are at the unofficial final of ten, with the next player eliminated receiving $32,456. The winner of the event will take home the bracelet and $568,974. Card Player Blogger Josh Brikis is still in contention for his first bracelet. Stay tuned to CardPlayer.com as we bring you a recap of the dayâ€™s events. After his stack had dwindled to just four big blinds, Hellmuth moved all in for just 80,000 after action folded to him on the button. Scott Vener made the call from the big blind with the A 6 and was ahead slightly against the Q 9 of Hellmuth. The board ran out J 5 2 2 3 and Hellmuth’s quest for his 12th bracelet was over. Players are now on a 20 minute break. Card Player blogger Josh Brikis is still left in the tournament. Stay tuned for more updates from the 2010 World Series of Poker. With 350,000 in his stack, Hellmuth called the 8,000 to complete the blind. Keith Lehr checked from the big blind. The board ran out J 8 4 5 7 with both players checking to the river. Hellmuth once again checked and this time Lehr fired out a bet of 20,000, prompting a muck from Hellmuth. Hellmuth was at 342,000 after the hand. 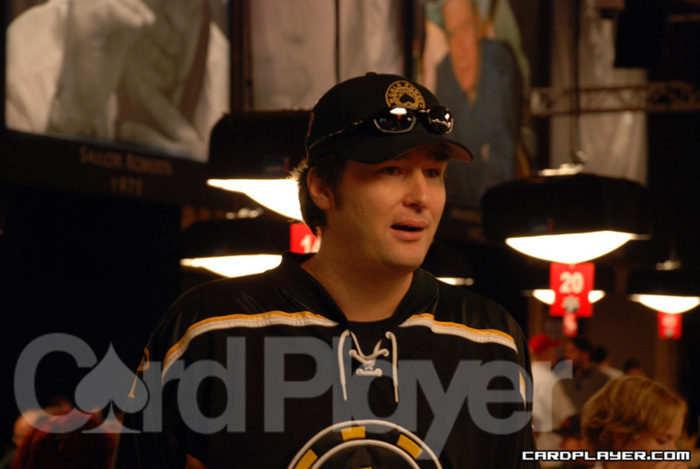 With about about 340,000 in his stack, Hellmuth made it 38,000 preflop from the cutoff. Keith Lehr made the call from the button and both blinds folded. The flop came 9 3 2 and Hellmuth checked. Lehr checked as well and the 8 fell on the turn. Hellmuth bet 60,000 and Lehr looked down at his cards because he said he thought he had the nut flush. He tabled the A 10 for the wrong black cards and mucked. Hellmuth was at 426,000 after the hand. An opponent in late position bet 40,000 and Hellmuth made the call from the big blind. The flop came Q J 3 and Hellmuth checked. His opponent bet 75,000. Hellmuth took off his glasses and contemplated before making the call. The 7 fell on the turn and Hellmuth checked. His opponent moved all in for 138,000 more and Hellmuth mucked. He was down to 367,000 after the hand. The remaining 25 players will return to the felt at 3 p.m. to play down to a winner. The blinds will be at 8,000-16,000 with a 2,000 ante. The field is guaranteed $16,275 but they will all be driven toward the $568,974 prize for first to go along with the WSOP bracelet. While many players fell on day 2, there is one very recognizable face returning on day 3. The “Poker Brat” himself, Phil Hellmuth, is still alive and very well as he will bring a healthy stack with him for the final day of play. Hellmuth, who already holds the record with 11 WSOP bracelets, will look to expand his all-time lead over Johnny Chan and Doyle Brunson. Stay tuned to CardPlayer.com as we bring you all of the elimination hands once the field reaches the final table.